Engaging with film (as with any art) is a daring proposition. Two hours of your life may not seem like much, but with that ultimate expiration date looming, time is a precious commodity. We should use discretion when choosing our cinematic entertainments. That’s not to say we should watch only “good” or “important” films. Instead we should take chances, prepare for disappointment, and above all, manage expectations. Expectations are informed guesses. Sometimes these guesses are the result of our natural excitement for a forthcoming film. Sometimes the excitement is imposed on us, with posters and teasers and trailers slowly trickling out in calculated fashion, enticing us to care when we normally wouldn’t. But expectations can also be a defense mechanism. We find ourselves drawing back from movies that might seem exciting in an effort to shield ourselves from disappointment. We hedge our bets so that we can mitigate the amount of misery we experience when watching a film we know will be a chore. When you go with kids to see Rio 2, you don’t expect a cinematic tour de force. Frankly, you don’t expect anything except a “run out the clock” situation. So when the lights come up, you don’t leave feeling worse than you thought you would. It’s not a matter of being a pessimist who’s pleasantly surprised or, conversely, an optimist who’s disappointed, but rather of being informed, open-minded, and aware of what you’re getting yourself into. Going into a movie with low expectations can render positive results. For instance, The Satanic Rites of Dracula was given to me recently. 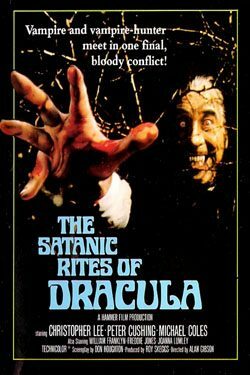 Satanic Rites is the last Hammer produced Dracula film to feature Christopher Lee as the anemic nightstalker. What I expected was a retread of your typical Dracula fare: stakes, hawthorne bushes, succubi, garlic, the creeping silhouette of our caped villain, etc. While it did feature tropes mentioned above, the movie also had an interesting premise: Dracula plans to eradicate the human race with a plague so that he might finally die. Dracula is not usually mired in existential crises. It’s not that it never happens with vampires – Anne Rice’s vampires are frequently grappling with the notion of eternity, and it was also a theme in the more recent Only Lovers Left Alive – but it took me off guard coming from a studio like Hammer, a studio where tongue-in-cheek is an ethos. Watching the mystery unravel as the heroes get closer to finding Dracula made for a satisfying dramatic experience that I was not expecting. Just to be clear, it’s not all roses. The third act devolves into a lot of gory spectacle and vampiric posturing. Oh, and geriatric wrestling. This stuff is satisfying in its own way – it’s an integral part of why we watch Hammer Horror films – but it fails to bring home the depth from the first two acts. With that said, it was still original and bold even in its failings. Check out the opening credits which at first I thought were a bit hokey but have since grown on me. Just as low expectations can render positive results, high expectations can render negative results. Being a film fanatic means having favorite directors, writers, DP’s, and actors. When their new projects come out we have a vested interest as people along for the ride through their artistic career. This can leave us believing that our favorites can do no wrong, which at times, is a proposition fraught with the risk of disappointment. When I heard about the The Counselor, a movie written by Cormac McCarthy and featuring Michael Fassbender, Javier Bardem, Penelope Cruz, and Brad Pitt, I was preparing to empty my wallet. I was not thrilled about Ridley Scott being on board to direct. Once upon a time he was a great director, but the years haven’t been kind to him and his dramatic blockbuster aesthetic doesn’t really jive with McCarthy’s raw, existential tales. I pushed that aside and figured that McCarthy’s words would shine through and the acting chops of the major players would bring McCarthy’s bleak vision of the drug trade through America’s border cities to life. However, I was vastly disappointed along with most of the world. The Counselor was a critically divisive film. Most panned it because the movie couldn’t sustain its bloated dialogue and philosophical musings. In its attempts to be meaningful and poignant, it’s obvious and unintentionally humorous. As an inveterate McCarthy fan I was baffled. In his novels, characters speak this way sometimes, but it doesn’t sound stilted and wooden like it does here. It’s not just the medium change because No Country for Old Men was a strong movie that brought McCarthy’s moral tale of death in America to pitch perfect realization on screen. 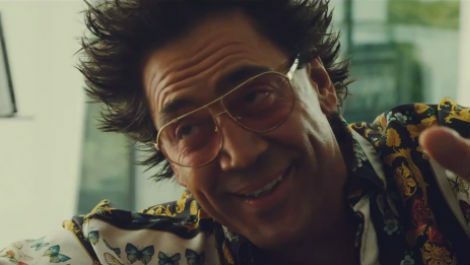 Bardem was even in that one, too. What are we to do? Always expect the worst? That’s not the right tactic either. When we expect the worst we are inclined to opt out of the experience and play it safe. Engaging with art is a daring proposition. While marketing campaigns and our experiences with artists’ previous work can give us an idea of what to look forward to, there are no guarantees of good or bad. Last week I talked about films that are equivalent to “cultural vegetables.” Even these movies that we are told repeatedly we should see, can offer no assurances. A movie that is important is not necessarily enjoyable. It may serve as education, not entertainment. We are better off assuming little about the movies we are going to watch. Our predictions are not always wrong, but at what point do they become self-fulfilling prophecies? Expectations are about perception, and in the end we may miss out on a lot if we’re not willing to approach a film with minimal inhibitions. The key is to approach movies with an open mind, taking our knowledge of the movie into consideration, but not allowing that knowledge to overshadow our ability to give the movie a chance. I think of it as an act of submission. Though I am aware of what movie I’m going to watch – the actors, the director, the basics of the plot – I give it a chance to surprise me, risking the loss of time and money in hopes that I encounter something that, in retrospect, I would regret missing. Only then is the film given a fair chance to work its magic. Art is always limited by how the viewer is willing to approach it. Let’s be conscious of the things we choose to approach, conscious of the type of experience they’re likely to deliver, but always willing to let it take us further than we believed was possible.